Full figured costume with wig! This Full Figure Fred Flintstone Costume is definitely fun to wear. With a look inspired by Fred himself, who could go wrong? With a giant necktie and foot covers, this is going to be the talk about costume at the party. 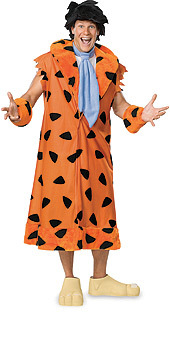 So have fun and a laugh while you wear this amazing Fred Flintstone Costume.